, Snapchat, Ocado and Wix have selected Google Cloud Platform because of our innovation and proven performance, combined with flexible pricing models. We’ve recently made headlines for our latest product introductions like Google Cloud Storage Nearline and Google Cloud Bigtable, and today, we’re also raising the bar with our pricing options. The price reductions in Europe and Asia are similar. 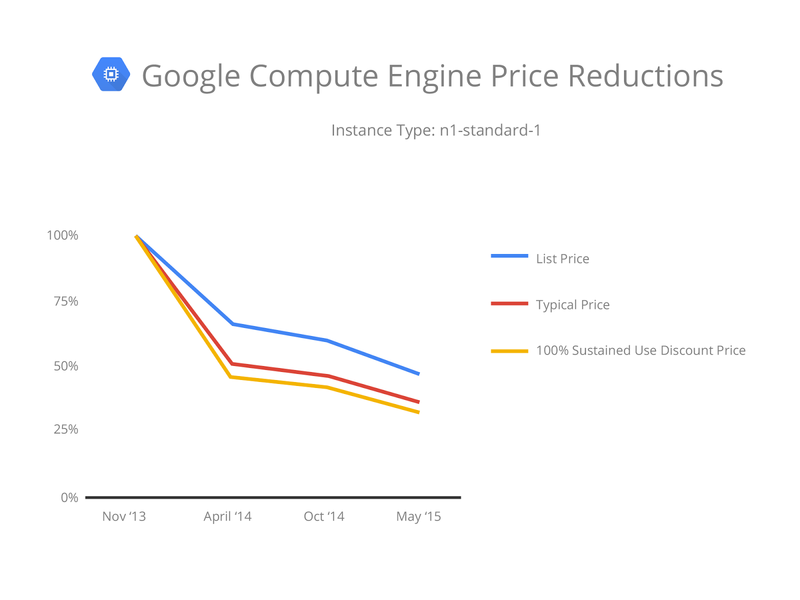 Complete details on our compute pricing is available at our Compute Engine pricing page. We have continued to lower our pricing since Google Compute Engine was launched in November of 2013; together, these price cuts have reduced VM prices by more than half. For some applications we can do even better: if your workload is flexible, our new Preemptible VMs will run your short-duration batch jobs 70% cheaper than regular VMs. Preemptible VMs are identical to regular VMs, except availability is subject to system supply and demand. Since we run Preemptible VMs on resources that would otherwise be idle, we can offer them at substantially reduced costs. Customers such as Descartes Labs have already found them to be a great option for workloads like Hadoop MapReduce, visual effects rendering, financial analytics, and other computationally expensive workloads. For further information about Preemptible VM pricing, please visit our website. Our continued price/performance leadership goes well beyond list prices. Our combination of sustained use discounting, no prepaid lock-in and per-minute billing offers users a structural price advantage which becomes apparent when we consider real-world applications. Consider a typical web application or mobile backend. Its development environment supports software builds and tests, presenting a bursty, daytime load on cloud computing resources. The production environment handles actual user traffic, with a diurnal cycle of demand, aggregate growth over time, and a larger overall footprint than the development environment. The developer environment would benefit from per-minute billing because it can be turned on and off more quickly and you only pay for what you use. The production environment would benefit from sustained use discounting, up to 30% additional discount with no upfront fee or commitment, because it always needs to be on. 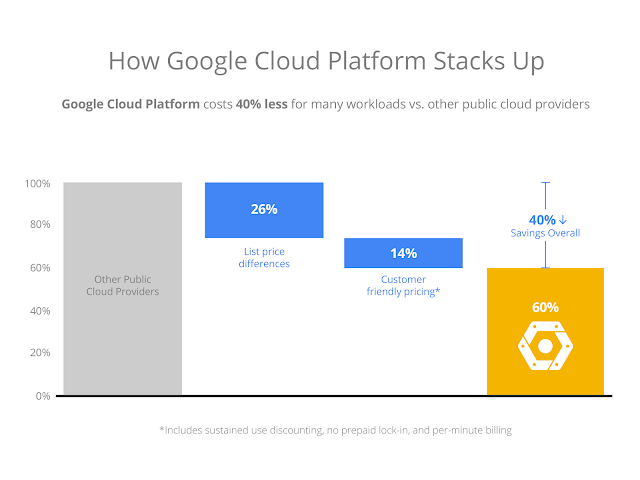 Our customer-friendly billing, discounting, and lack of prepaid lock-in, combined with lower list prices, leads to a 40% lower price on Google Cloud Platform for many real-world workloads. Our TCO Tool lets you explore how different combinations of development and production instances, as well as environmental assumptions, change the total cost of a real-world application hosted in the cloud. Many factors influence the total cost of a real-world application, including the likelihood of design changes, the rate of decrease of compute prices, and whether you’ve been locked into price contracts which are now above market rates, or on instances that don’t fit your current needs anymore. With Google Cloud Platform’s customer-friendly pricing model, you're not required to make a long-term commitment to a price, machine class, or region ahead of time. This graphic illustrates how our lower list prices and customer-friendly pricing practices can combine to produce a 40% total savings. Your exact savings depend on your specific application, and may be even greater than what is shown here. To see the impact of our customer-friendly pricing on your specific workload, explore our TCO Tool. If you have specific pricing questions, please visit the updated pricing page on our website. To get started with testing your own workload, we’ve made it easy with our free trial program. We know you have a choice of public cloud providers – and choosing the best fit for your application or workload can be a daunting task. Customers like Avaya, Snapchat, Ocado and Wix have selected Google Cloud Platform because of our innovation and proven performance, combined with flexible pricing models. We’ve recently made headlines for our latest product introductions like Google Cloud Storage Nearline and Google Cloud Bigtable, and today, we’re also raising the bar with our pricing options.